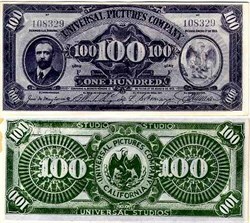 Beautiful 100 Dollar Movie Prop Paper Money from Universal Pictures Company. This historic bill was printed and kept by the Ellis Mercantile Company for use in motion pictures over the years. The note has a vignette of a man and an eagle and it says Universal Pictures Company on the front and back. This a very nice looking note and is very popular. This is a very unique item that combines old paper money with Hollywood Movies. 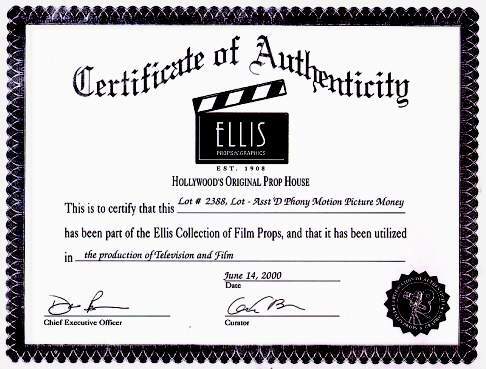 We will include a copy of the Certificate of Authenticity from Ellis Props and Graphics with every order.